Steam, rising from the cooling towers of a coal-fired power plant shows the important part water plays in generating electricity. As new technology choices that reduce greenhouse gas emissions become more important in mitigating the impacts of climate change, water demand too will be an important consideration for resource and policy planners. Enlarge Image. Results: Generating electricity using new low-emissions technologies is not likely to increase water demand through the end of the century, according to new research at Pacific Northwest National Laboratory and the University of Alberta. To find how the choice of technologies to generate electrical power may impact the global and regional economy, water use and emissions, the researchers turned to an integrated model of human and earth systems to understand future costs and decisions. Even with the higher costs associated with cooling methods other than water they found that low-emission technologies can be a viable choice for power generation. Why It Matters: Today, electrical power plant cooling uses about 15 percent of the world's water. A growing demand for electricity may increase that use. Because producing electricity accounts for about 35 percent of CO2 currently emitted, low-emissions power generation technologies could have substantial benefits in overall emissions. However, several technologies thought to be important for reducing power sector emissions are also relatively water-intensive. Water availability could impose limitations on future technology choices and limit the power sector's capacity to reduce emissions. Methods: The researchers set out to address three knowledge gaps in understanding the impacts on water use from cutting CO2 emissions in the power sector. First, previous studies have focused on individual technologies and not the mix of generation technologies. Second, there have been no links to technology shifts predicted to occur in response to emissions pricing and the impacts those shifts will have on water. And finally, existing studies have not considered how additional costs associated with air-based cooling systems will influence economy-wide strategies for mitigating emissions. The research team, working at the Joint Global Change Research Institute (JGCRI) in Maryland and the University of Alberta, developed a technology-level database of water demands per power generation technology in each of 14 global macro-regions, consistent with available water demand estimates in various countries. They projected the different cooling system types expected to be used in each of the regions in the future, based on existing water quality laws in many developed nations, and considering present-day water scarcity issues. Using the Global Change Assessment Model (GCAM), an integrated model of human and earth systems developed at PNNL with support from the U.S. Department of Energy, the team assessed the power sector's water demands for three climate change mitigation policies: no action to limit climate warming due to greenhouse gas emissions; stabilization of radiative forcing at 4.5 Watts per meter squared (4.5 W/m2); and stabilization of radiative forcing at 3.7 W/m2. 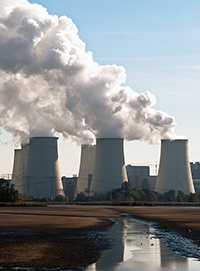 To address uncertainties in the power sector's responses to climate policy, the scenarios also included two power generation technology strategies, one focused on thermo-electric generation technologies-nuclear energy, coal, gas and oil-and a second strategy focused on deploying renewable energy such as solar, wind and geothermal technologies. What's Next? The researchers are working to integrate GCAM's water demand component into a water supply component and incorporating power plant cooling system choices within the model to improve projections of water use throughout the global economy. Sponsor: The research was funded by the U.S. Department of Energy (DOE) Office of Science Integrated Assessment of Global Climate Change Program. The research used Evergreen computing resources at the PNNL's Joint Global Change Research Institute (JGCRI) at the University of Maryland, which is also supported by DOE's Integrated Assessment Research Program. JGCRI is a partnership between PNNL and the University of Maryland. Research Team: Page Kyle, James Dooley, Steve Smith, Leon Clarke, James Edmonds and Mohamad Hejazi at PNNL; and Evan Davies at University of Alberta, Canada.